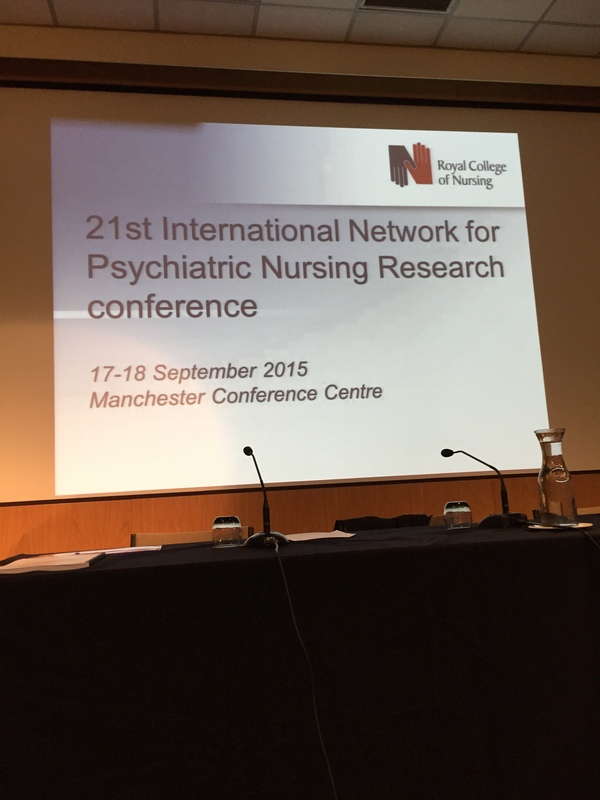 The 21st Network for Psychiatric Nursing Research (NPNR) conference took place on Thursday and Friday, September 17th and 18th 2015, with the theme of ‘Building new relationships in mental health nursing: opportunities and challenges’. The occasion was a fine one, with just short of 200 people in attendance. For those not able to make it but wanting to know more, the programme can still be found here and the book of abstracts here. I’ve been on the NPNR scientific and organising committee this year, courtesy of my membership of Mental Health Nurse Academics UK. This afforded me the chance to welcome delegates at the conference opening, and to draw attention to the just-breaking news of Professor Len Bowers’ planned retirement at the start of 2016. Len has been an inspirational mental health nurse researcher: more on this later. Introduced by Professor Liz Hughes as day one conference chair, this year’s keynotes commenced with Professor Karina Lovell giving an overview of the current state of knowledge in remote psychological therapies. Karina is a world leader in research into interventions for people with commoner mental health problems such as depression and anxiety, as well as being actively involved in services and practice through her work with organisations like Anxiety UK and others. For an example of important new research in this area check out the REEACT trial into computerised CBT for people with depression. This is an important study which Karina both referenced in her talk, and is actively involved in. Dr Geraldine Strathdee, NHS England’s National Clinical Director for Mental Health, delivered a second keynote on using mental health intelligence. She praised the work of nurses, and made a strong case for mental illness prevention. Geraldine also reminded delegates of the high rates of premature mortality of people living with mental health difficulties, and the continued exclusion of many from employment. As routes to improvement she pointed to leadership, and the value of data to benchmark and drive up standards. Keeping up with the evidence: an impossibility? Therapeutic approach, or therapeutic alliance? 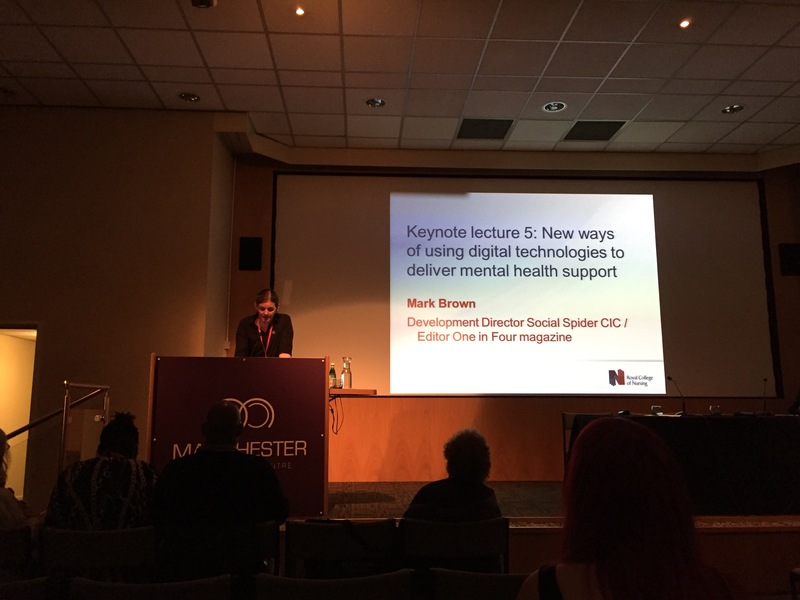 Chair for day two was Professor Doug MacInnes, one of whose duties was to introduce Professor Shôn Lewis from the Institute of Brain, Behaviour and Mental Health at the University of Manchester as the deliverer of the conference’s fourth keynote lecture. 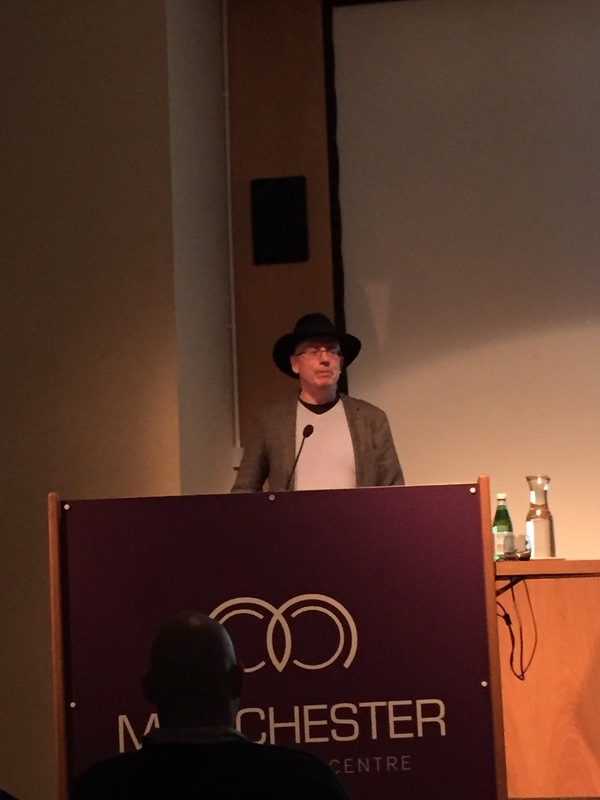 Shôn spoke about current approaches to the care and treatment of people with psychosis and schizophrenia, using findings from the non-commercial CATIE and CUtLASS trials to suggest that newer antipsychotics are generally no better than first generation antipsychotics. Shôn also referenced the SoCRATES trial to evidence the idea that outcomes are associated with the quality of the therapeutic alliance, rather than with the specific therapeutic approach used. SoCRATES, I have now discovered, compared the effectiveness of (1) CBT plus routine care, (2) supportive counselling plus routine care and (3) routine care alone for people with schizophrenia. Shôn devoted the last part of his presentation to ClinTouch (a mobile phone app to record and upload symptoms) and CareLoop (which is testing if ClinTouch can be connecteded to NHS IT systems and to everyday practice). #NPNR2015’s final keynote was delivered by Mark Brown, and the full text of his talk can be read here. Mark edited One in Four magazine, and is now development director of Social Spider, runs the Day in the Life project and is part of the team behind the WeMHNurses Twitter meeting place. Drawing on personal experience of its usefulness he described digital technology as less of a possible future than an unfolding present. One example of tech in action, which Mark referred to in his talk, is his own Doc Ready website. This was designed to help people prepare for discussions with doctors about their mental health difficulties. That’s summary enough of the keynotes. From the concurrent sessions I participated in, chaired or observed I’ll first start with the SUGAR meets Dragons’ Den workshop. 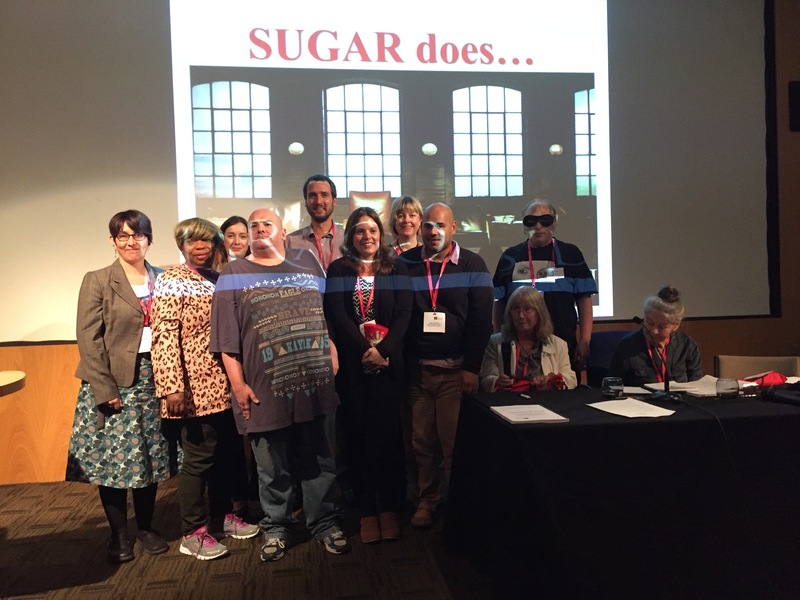 Three volunteers – Jason Hickey, Laoise Renwick and Cher Hallett – pitched their research ideas to SUGAR members. In the event, SUGAR offered their time and support to all three, but also voted Cher’s plans (on intramuscular injections) as the best of the batch. In the second concurrent I’m picking out, Julian Hunt, Alan Meudell and Michael Coffey presented reflections from Plan4Recovery. This project, which I’m also part of, is examining shared decision-making and social networks for people using secondary mental health services. And, finally, a word about our COCAPP symposium. This started with an overview paper from Alan Simpson, was followed by a presentation from Michael Coffey titled, ‘Ordinary risks and accepted fictions: how contrasting and competing priorities work in risk assessment care planning’ and concluded with a paper from Sally Barlow and me on participants’ views and experiences of recovery and personalisation. Organised by Laoise Renwick, this year for the first time the NPNR conference featured a poster trail. This worked well. Displayed posters were themed, and during lunchtime on day two guided delegates took opportunities to speak with those associated with them. Along the way I spotted some interesting posters from the RCN, drawing attention to an upcoming history of mental health nursing exhibition (organised with lots of help from Ian Hulatt) about to launch in London. Finally, a word on Len Bowers. At Doug MacInnes’ invitation, Len took to the lectern during the afternoon of day two to confirm his upcoming retirement and his plans for the future. These include (we learned) playing the flute, travel, photography and electronic music-making. Very nice. Len is a generous, principled and humble man whose contribution to creating new knowledge for mental health nursing has been immense. Take Safewards as an example. This is Len’s NIHR-funded programme grant, findings from which are changing practice in the UK and around the world. That’s some achievement, in my book. We wish him well. This entry was posted in Mental health, Nursing, People, Research and tagged antipsychotic medication, carer researchers, COCAPP, digital technology, evidence, history, Mental Health Nurse Academics UK, Network for Psychiatric Nursing Research, Plan4Recovery, psychological therapies, Royal College of Nursing, service user researchers. Bookmark the permalink.